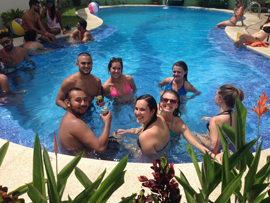 Want the perfect pool party during you Costa Rica Bachelor Party vacation? Not a problem, this is after all Pura Vida land, and we are in the Epic Party business, we have that covered. In fact we have pool parties down to a fine art; we have planned, organized and delivered over 600 Jaco Beach Pool Parties. Of course that’s just the Primary Checklist. And our favorite… a Twister Game…you will just have to see it to believe it, Costa Rican girls have incredible imaginations at this game (WARNING: Unless you require evidence we suggest you turn off any recording devices)! Too many more options and special treats to list here. If you are looking for ‘over-the-top’ to vault your party into the Epic Chronicles of Costa Rica, just let us know. How about a naked sushi girl platter? Party spreading out onto the beachfront? Not a problem, how about a Brewski Delivery Drone to your buds on the beach? Or maybe the Kings party requires this pool party to happen on an 80' luxury yacht? Your party pool day may have to begin in recovery mode from the night before, so your chef will have a killer breakfast-of-champions prepared. You may have to kick start the engine with some adventure in the morning, so we got that covered as well, with sportfishing boats (nothing like a sail fish or marlin to get the motor running, or some mahi-mahi for the pre-pool party BBQ lunch), ATV tours, zip lines, white water rafting or any other adventure tour you can imagine. But if the recover mode that day has been classified as ‘critical’… snoozing at the pool, or hanging at the beach and beach bars might be in order. We have years of experience at Costa Rica bachelor parties, pool parties, adventure tours and fun-in-the-sun planning, give us a shout and let’s get this party started? "Are a wild & crazy time! Pool Parties generally run from noon until 6:00 P.M."
"Pool Parties include: DJ, Bartender, Chef, 2 Waitresses." "Served Barbecued Ribs, Home-made Beans, Salads, Beer & Mixers." "We aim to please! Customize the menu or party time; after all it is your party!" Chauffeur/concierge personnel the entire stay. 4 hour ATV Jungle Waterfall tour. Dinner includes: 2 starters, 1 salad, 1 main course or protein, 2 sides and a dessert. Girls to party with and hang out in the pool. separate charge.